Shock Coffee Triple Latte is an RTD cold iced coffee drink. It has three shots of espresso in it and according to their website the caffeine amounts vary from batch to batch. Shock Coffee Triple Mocha also has 231mg of caffeine per can. According to reviews at bevnet and caffeine examiner it is supposed to be one of the best tasting pre-packaged coffee drinks on the market. Note that this is among the most highly caffeinated iced coffee drink available. 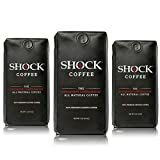 Shock Coffee also makes a line of highly caffeinated ground coffees with up to 50% more caffeine than traditional gourmet coffee. 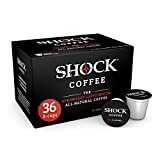 Shock Coffee 36 Count Single Serve Capsules for Keurig K-Cup Brewers, 0.44 oz. Shock Coffee is a brand of highly caffeinated coffee. They advertise that their coffee has 50% more caffeine than regular coffee. Here we review Shock Coffee as well as their canned coffee beverages. I will preface this review of Shock Coffee Energy Blend by stating that I love coffee. Putting aside the fact that it is nature’s energy drink, and the fact that it is more socially acceptable in the workplace than a can of Monster, it tastes great. Coffee also has antioxidant benefits, as well as being linked to the reduced risk of several diseases. Okay, now that I’m done with the rant on coffee, on to the review. Those familiar with coffee will notice that this Shock Coffee is a very dark roast. The flavor is quite bold, so if you do not normally drink black coffee you will definitely want to add some sugar and/or creamer. I enjoy my coffee with no additives normally, and I added a little Splenda to sweeten my cup. It has a slightly more bitter taste than regular coffee, but this is mostly unnoticeable. This is a ground coffee, so the ingredients are just ground coffee beans. The packaging and Shock’s website says that this coffee is twice as strong as normal coffee. The amount of caffeine really depends on how many tablespoons of coffee you put in. I drank a cup of Shock that was brewed the same way I brew my Starbucks coffee. I figured this would be the best way to test the effect. Normally, my coffee makes me somewhat more alert with no real crash at the end and no jitters. About fifteen minutes after drinking Shock, the jitters started to set in. I was amazed as I haven’t gotten the jitters from my caffeine in a long time. This lasted for about an hour, but the energy I got lasted much longer, around 4 hours. I did crash a little bit at the end, but this could have been due to the fact that I was running on little sleep. Shock Coffee Energy Blend is awesome. If you like dark roast coffee and want a great pickup, I would recommend checking this out. I know several convenience stores carry Shock now, and this would be worth checking out for the coffee lovers out there. The buzz I got from Shock was something I haven’t felt in a long time. Shock Coffee could be dangerous for some due to its high caffeine content. Shock Coffee recently sent me some samples of their Triple Latte and Triple Mocha Iced Coffee Drinks. I had a serious addiction to iced coffee a few years ago. Starbucks had launched their Frappuccino line of drinks and the convenience of picking up a great tasting coffee drink before class was too irresistible. Today it seems like the all the big companies have their own line of coffee energy drinks, and thus the market is crowded with competition. 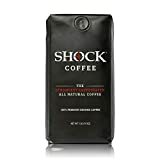 Is Shock Coffee a contender? 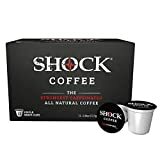 I tried the Shock's Triple Latte flavor first and was greeted with a smooth roast coffee with the right amount of sugar and cream. To be honest, the flavor is pretty much indistinguishable from the Starbucks iced coffee. The Triple Mocha flavor was the same, with the added chocolate flavor that was present without overpowering the drink. The two Shock Iced Coffee flavors were excellent by my tastes. Both Triple Latte and Triple Mocha have 150 calories and 23 grams of sugar. The caffeine amount is undisclosed, but brewed espresso coffee is the first ingredient so the caffeine content is likely high. In addition, there is some added caffeine not from the espresso. Editor's Note: According to our earlier research Shock Triple Iced Coffees have 231mg of caffeine. I noticed a decent buzz with Shock Triple Iced Coffees. For me, it takes quite a bit of iced coffee to provide a lift, but both Triple Latte and Triple Mocha delivered by themselves in an 8 ounce can. I got a quick rise that lasted for a few hours, but there was a substantial crash at the end. I would attribute this to the large quantity of sugar in these iced coffees. If you are into coffee and enjoy Starbuck's Double Shot you will not be disappointed by Shock’s iced coffees. Both the Triple Latte and Triple Mocha flavors are excellent and there is a decent buzz to be had. I would watch the sugar and calories though. Can't Find Shock Coffee in your area? You can buy it in bulk here. Sugar content: 27 grams (per 8 ounces). Shock Coffee Triple Latte contains 28.88 mgs of caffeine per fluid ounce (97.64mg/100 ml).